GALT — Jesse Roseman, a nature preserve manager, stalks along a pond in search of a very big and rare bird that evolved wading in the primordial ooze that once covered much of the Central Valley. Sometimes called the “rib-eye of the sky” in states like Kentucky, where its hunting is allowed and where it thrives in wetlands, the sandhill crane population declined sharply in California in Gold Rush days, when the birds were sold like turkeys in San Francisco butcher shops. But in the past two decades, its population here has stabilized, with the help of new, crane-friendly farm practices that have helped preserve its habitat. And today, in the middle of the winter crane season, those who have fought for the crane are celebrating the success of that effort. “When you have so little of our original wetlands left, we want to make the most of what we have,” said Roseman, the Nature Conservancy’s project director for the Cosumnes River Preserve. That Central Valley preserve is a prime viewing area for cranes during their stay from November through early March. It has been a long road back for the sandhill crane. Hunters nearly wiped out the cranes in the 18th and 19th centuries, but hunting limits and habitat restrictions have prevented their extinction. Sandhill hunting is allowed in 13 states but not California, where dikes, dams, pumping and plowing have wiped out about 95 percent of Central Valley wetlands — its natural habitat. Unlike Wisconsin, which is considering allowing sandhill crane hunting and had about 25,000 birds in October, the greater sandhill crane is listed as a threatened species in California with its numbers limited to perhaps 8,000 birds, biologists say. Lesser sandhill cranes may number about 25,000. The gray-colored birds with red caps stand up to 5 feet tall and have a wing span of 6 to 7 feet. They fly in for winter to fatten up on bugs and grain, rest, and perform exotic, acrobatic mating dances that delight bird watchers. Roseman and others at the 46,000-acre Cosumnes River Preserve in the eastern Delta are prepared to help keep the birds coming back. The Nature Conservancy partners with farmers, government and nonprofit groups to manage crops, grasslands and water to provide food and shelter for cranes and other birds on the Pacific Flyway migratory path. Farmers flood fields at strategic times to stir up bugs for the cranes. Farmers harvesting corn often leave a little corn stock behind to nourish the birds. Some rice and grain farmers are paid government incentives to adopt bird-friendly farming practices, and others enjoy the feeling of helping the crane, held as a symbol of prosperity and longevity in many cultures, Roseman said. “Our goal is to provide economically viable farming that is beneficial to birds,” Roseman said. On a recent rainy day at the Cosumnes Preserve, which includes the Nature Conservancy’s 9,200-acre Staten Island — the winter home to thousands of sandhill cranes — hundreds of the birds clustered together in a field, feeding, hanging out and bobbing their long necks up and down. “I think the cranes are awe-inspiring to many people because they are so large, they make music and because they dance,” said Sara Sweet, a preserve restoration ecologist. Adapted to live in flat, open fields, wetlands and ponds, the crane has a back claw located differently than most birds — limiting its ability to grasp branches and roost in trees. To find safety at night, the cranes stand in ponds several inches deep. Coyotes trying to hunt cranes are given away by their splashing. 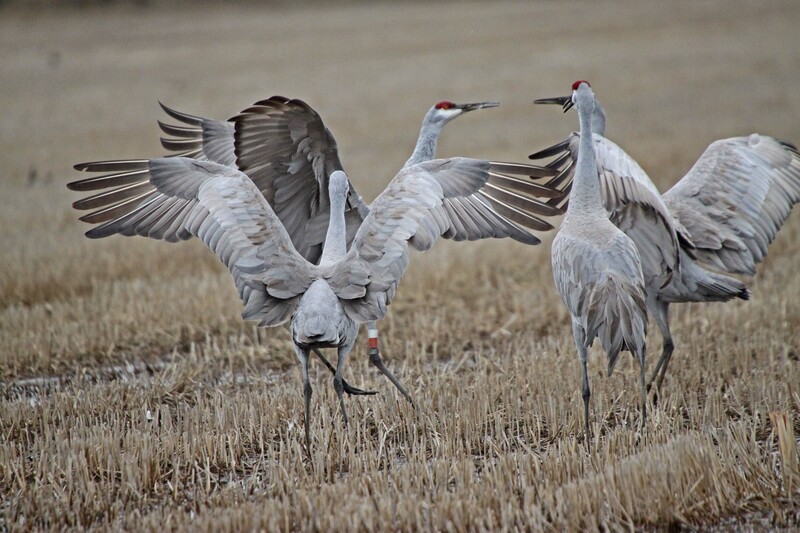 Naturalists say birders like the crane’s sociability, including their dance. The ballet-like liftoff and wing flapping reinforces the bonds of cranes — which mate for life and can live up to 40 years. Although West Coast hunting limits and new farming practices are helping the crane population stabilize, not all is rosy. “The population is doing OK, but there are concerns,” said Gary Ivey, an International Crane Foundation biologist who has studied the cranes for decades. In the crane breeding areas in Oregon’s Klamath basin, more efficient agricultural water use practices could be having the unintended effect of creating shortages for the cranes, Ivey said. In the Delta and Central Valley, conversion of grain fields to vineyards and olive orchards has shrunk winter habitat for the cranes, Ivey said. Cranes are simply too big to take off and land close to vines and trees — like a huge bomber trying to use a runway for small planes. Protecting the wetlands and grasslands habitat remains a key challenge to protecting the future of the sandhill crane, Ivey said. Staten Island: West of I-5 and north of Highway 12, visitors can drive or walk on North Staten Island Road to view birds.